PENTAX offers a selection of optional accessories to further enhance the K100D Super’s creative capability and operability. • Simultaneous recording of two images from different perspectives with a single shutter release. 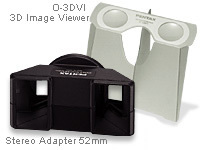 • 3D image viewer (included) for easy three-dimensional viewing of printed photos. • Outstanding lens compatibility: Any lens covering the angle of view equivalent to the 50mm focal length (in the 35mm format) is usable.